Today's MGB Food Review is going to be one you may not have expected. 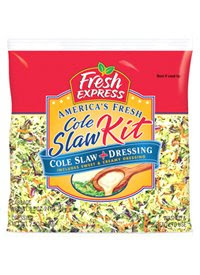 I have always liked cole slaw (creamy version, not the vinegar version) and am pleased to announce that the Fresh Express Cole Slaw kit (see image) is a key buy when you are an MGB eater. This is normally found in the produce dept. and comes with a packet of sweet/creamy cole slaw mix. I only use a small amount of the mix.. just enough to make it a little moist and taste good. I also add extra SALT which is a condiment that MGB'ers can eat all day long. The slaw consists of cabbage and carrots all chopped up and ready to go! If you like cole slaw give this stuff a try.. At $1.80-$2.49 per 9oz of Cole Slaw it lasts me about 3 lunches. 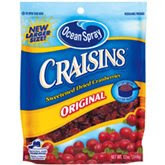 For an extra kick... add the Ocean Spray Craisins to your slaw.. These sweetened dried cranberries add a nice taste and are healthy too!